Discussed the state of the science in tropical land modeling, processes poorly captured in models, and potential experiments that would test and improve tropical land model fidelity. These issues were discussed with an emphasis on three major tropical ecosystem locations that may be candidate regions for NGEE Tropics field studies: the Amazon Basin, Congo Basin, and Southeast Asia. Suggested citation: U.S. DOE. 2012. 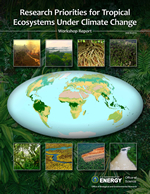 Research Priorities for Tropical Ecosystems Under Climate Change Workshop Report, DOE/SC-0153. U.S. Department of Energy Office of Science. science.energy.gov/ber/news-and-resources/ .